World Snooker Championship Day 7: Neil Robertson saw off David Gilbert by 13-9 to be the first man progress to the quarter-finals. 2010 World Champion led Gilbert by 5-3 after first session had completed. The last two sessions were played today, with Robertson extended his lead to 10-6 with runs of 76, 77, 82 and 92. Gilbert put up a strong resistance at the final session. Robertson took the first frame of the session before Gilbert won the three out of the next four with 69, 121, 67 but Robertson collapsed his hopes to win 13-9. "I take my hat off to David because he hung in there and gave it everything," said Masters champion Robertson. "He played to top 16 standard and never looked under pressure.'' Gilbert said: "It was such a buzz to play here and it makes me determined to get out of the cubicles and get to more venues." Robert will play the winner between Ronnie O'Sullivan and Mark Williams, he said, "I'd love to play Ronnie next because it would be a great atmosphere and I've got a good record against him, he brings the best out of me." 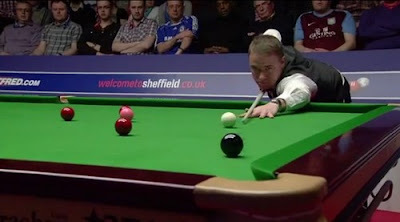 Stephen Hendry encountered the Defending Champion, John Higgins in the last 16. This is the first time they play each other at the Crucible. 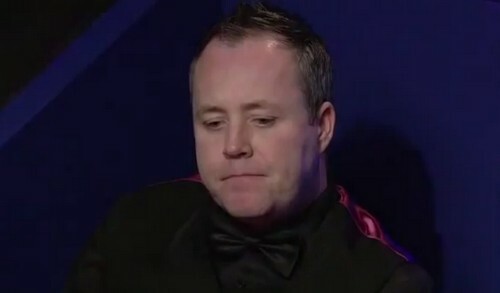 After two sessions of playing, Hendry had an huge advantage over Higgins, 12-4 requiring just one more frame to reach his first ranking quarter-finals since 2010 China Open. 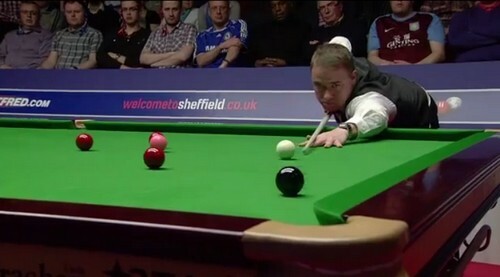 The high-quality first session, ended up Hendry led 5-3. Hendry made 81, 69, 93, 123 and 67 while Higgins knocked 124 and 52. However, the defending champion struggled at the night session. Both players made loads of errors but Hendry took the advantage on Higgins, he took sevens frames out of eight they played. 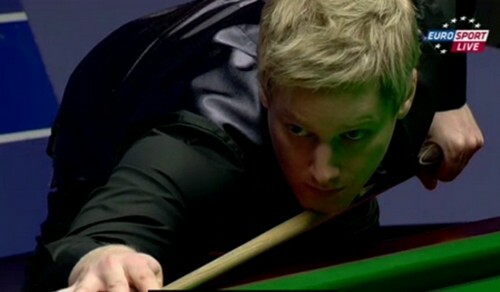 On-fire Maguire dominated his match against Joe Perry. Maguire found his form and won six frame out of eight they played to lead 11-5. Runs of 91, 80 and 75 helped Maguire to outplay Perry. He just needs two more to advance to quarter-finals. Ryan Day leads Cao Yupeng by 6-2 as the Chinese qualifier showed signs of nerves and missing crucial shots.